Defender Ciaran Coll is loving life at Derry City. DEFENDER Ciaran Coll was thinking about packing his bags and moving to sunny Spain before he got a text message from Paddy McCourt. Coll, who helped Finn Harps gain promotion back to the Premier Division, was seriously considering moving to Madrid where his girlfriend, Victoria Wilson, is currently teaching, everything changed when his former Harps team-mate contacted him out of the blue to say that Derry City wanted to sign him. It has been different class here. I have enjoyed every minute of it and I’m looking forward to the start of the season. “To be honest I was planning to move to Madrid where my girlfriend is but lying in my bed one morning, I noticed a missed call from a northern number and then the next minute Paddy McCourt was texting me to say ‘Decky’s looking to ring you’ so it was probably a good job I didn’t miss the text as well,” he joked. 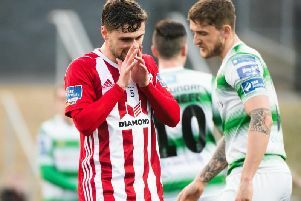 Coll has already had a small taste of what life at Brandywell is like when, as a teenager, Stephen Kenny invited him to train before he made the move to Scottish Premier Division club, Hearts. “I moved to Scotland when I was 15. Stephen Kenny was the manager at Derry and I had a few training sessions with them,” he stated. “Kevin McHugh had just left but Ciaran Martyn was here, Pizza (Peter Hutton), Deerso (Kevin Deery) and back then even though it was just training, I loved it. “I remember we were training over in Prehen and Mark Farren, God rest him, he hit me with a snowball but it was great fun and brilliant to be training with what was a very talented Derry side. The ex-Harps admits it was a case of his head ruling heart when he made the decision to remain in Ireland despite Victoria’s stint in Spain. “Victoria is only in Spain for one year which was probably the critical factor. “I live five minutes away from the Brandywell in St Johnston, while she is teaching in a secondary school in Madrid but she is only going to be there for a year, so once Derry came in for me, I couldn’t turn them down. “It has been different class here. I have enjoyed every minute of it and I’m looking forward to the start of the season. “The staff, the players and the supporters have been brilliant since I joined and, to be honest, it has just been different class at the minute. “When the Brandywell is jammed it’s an extra man for us. I’ve played here a few times with my previous club but I’m glad now that I have the Candy Stripe jersey on me. Hopefully the crowd turn up in numbers for the first night and push us on to get the three points and we can then kick-on from there to the next one.